The powerful energies of new beginnings, healing, balancing, and angelic love are now present on the planet in full force! This light is ready for you to tune into and integrate in body, mind, spirit and all aspects of life. Join Archangel Metatron in this channeled message of light as you are guided to connect with your inner light and feel it raise as you receive a powerful healing and attunement of your conscious and unconscious mind. Wishing you incredible blessings of love and positive new beginnings! Indeed, I Metatron am here and I greet you in this now, in the time of great change and shift upon your planet. Whether you are aware of the changes in light, the influx of light, or if you are not, allow yourself to tune in, in this now, and greet us in the realms beyond, within the light. Begin to relax into the new energy broadcast your way now. Tune into the new energetic wavelengths of love present upon your planet and present within you, your inner being, your inner power. Opening, integrating and joyfully celebrating your full and total connection with the higher power within you is the ultimate goal, the purpose of the ascension transformation that you are undergoing now, evolving in body, mind and spirit from your open heart. In this now, through your quiet, calm and stillness, feel your energy lift with the power of love and well-being. Witness love flowing into your conscious awareness now, as you drop even deeper within, infusing your being with light. You see, this is what you have been experiencing in the physical, and through this influx of light and love, unconscious barriers, patterns, beliefs and tendencies which are of a lower vibration, are drawn to the surface to be ascended, or to release. We join you in doing this now. Simply relax, know that you are incredibly loved always in this now. You, as you are in present moment, are dearly, truly, unconditionally loved. From within you great changes in your life and on your planet are made manifest. Open your heart and feel. And as you do, allow yourself to remember through your experience now that you indeed are connected to a power greater than your current comprehension. You are in this now, connected from your open heart to a power within you. Not I who is speaking these words, not anything outside of you, can bring you more closely aligned to your highest calling, your truth, your purpose, your joy. You, and the inner light and power and divinity you hold in this now contain that power. Relax your mind now and allow your conscious and unconscious to become attuned to love. Relax your mind and allow your mind to open to its highest possible potential. Rise above the wondering and questioning of ego mind and, in this now, rise into feeling and experiencing your connection with your higher mind. You have the ability in this now to tune in to the light. In through your mind and in through your heart, allow light to permeate, and to fill your being. And now, simply relax. Let go of the perceived limits, doubts, unconscious blockages, negative programming, limiting belief, and fear. Let go, for there is more power in you. Believe in this, your ability to create change from within your heart to manifest positive experiences, love, excitement, joy and bliss in your life and in your world. Feel this bliss now in your body and in your spirit. Experience feeling your connection to spirit, feeling your conscious mind and your unconscious mind united in this now, united with love. Imagine in your mind’s eye, in the center of your head, a rose blossoming, filling your thoughts with love, with hope, with belief that you truly create with your consciousness. Let love be the force that you use to create your experience. Learn your lessons gently and gracefully and lovingly. Allow your highest potential to manifest in form. You are at a powerful beginning, and with the power of the universe behind you, your dreams and intentions will come to be. Allow them to blossom in thought. Choose to creatively co-create with the universe your ideal vision, and your inner knowing of what is right for you. And now, as you once again relax into your heart, feel the vision of the flower, the power of your conscious and unconscious mind centered and reunited with love, anchoring now into your heart, into your solar plexus, and grounding into the earth. Return to co-creating with spirit, co-creating with earth, living in balance, in harmony, in love and joy. Your time is here, your cycle of opportunity is now. The stars align for great change for new beginning and for growth. Your inner earth springs into growth, the garden of your soul is ripe. Nurture your inner desires, your heart’s prompting, and allow your inner spirit to bloom. Birth your desires and your dream into your now. Beloved one, you are dearly loved, assisted. You are truly loved in this now and always. 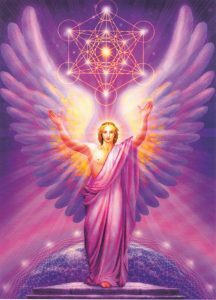 We of the angelic realm are with you; I, Archangel Metatron, indeed. Call upon us at any time. You are dearly loved. Dear arch angle Meteran please bless me with a new Partner one that cares respects loves gives understands and is honest we me himself and life. Love light patience faith wealth health protection from harm evil jealousy and motivation to move forward positive.